I first heard about this PALM CARD from my brother. He was raving about it. Since their office manager has one and he said it is a real value for money. Ilan order mo lang bawi mo na yun binayad mo sa PALM CARD. Pagka nag order ka ng isang pizza may kasama na siyang libreng isa pa! Akalain mo yun? At kung sa inaakala mo yun na yun! 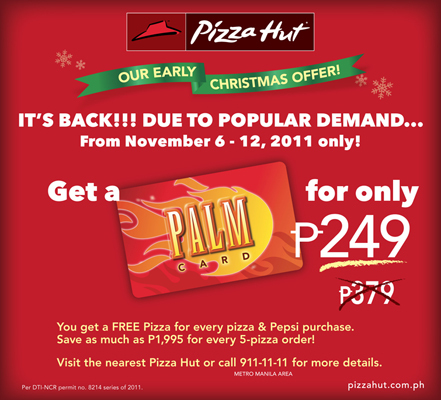 May promo ang Pizza hut sa palm card. Sa halagang P249 may PALM CARD ka na! If dati puro delivery lang siya pwedeng magamit ngayon pwede na rin siya sa dine in! So go na i blow-out na ang barkada sa Pizza hut! How do I get a PALM CARD? Simply present the card upon ordering to avail of the FREE pizza. Card is non-transferable and is valid for six months from date of purchase (signature of card should be same as the one on the receipt for validation purposes). Before ordering show this card for take-out, or give the card number when ordering for delivery. Maximum of 5 paid and 5 free pizzas per order. Your free pizza is not convertible to cash. Not valid with any other promotions, discounts and privilege cards. Not valid in Pizza Hut Express and Bistro restaurants. Card is valid for 6 months from date of card purchase. Pizza Hut reserves the right to dishonor or confiscate the card if the use does not conform to the terms of this card or if found tampered or faked. Pizza Hut will not be liable for any lost card. * Except Create your Own and De Luxe Cheese pizza. ** For Delivery, soft drink purchase must be 2.0 liters Pepsi or 1.5 liters Pepsi / FOR DINE IN SOFTDRINK PURCHASE MUST BE 2 GLASSES PER TRANSACTION. *** Their customer service representative will inform you of the free pizza of the month upon ordering.